Nara Prefecture is located in the Kansai region of Japan, which lies in the central part of Honshu Island and is adjacent to Kyoto and Osaka. 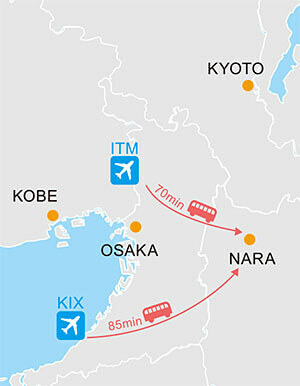 There are two international airports near Nara: Kansai International Airport (KIX) and Osaka International Airport (ITM). The easiest way to travel from the airport to Nara is by limousine bus, which takes 85 min from KIX and 70 min from ITM. Another option is to take a train, through the train connection from the airport to Nara is a little complicated. The West Japan Railway (JR) and Kintetsu Railway also provide easy access to Kyoto and Osaka from Nara. For more information, please visit the Official Nara Travel Guide website: www.visitnara.jp . Nara Prefecture is the historic and spiritual center of Japan, being the place where the first capital city was built over 1300 years ago and Buddhism first flourished. Close to Kyoto and Osaka and readily accessible by train, Nara has a multitude of United Nations Educational, Scientific and Cultural Organization (UNESCO) World Heritage sites and well-preserved temples and shrines. However, much of the region is still semi-rural, with picturesque villages and a rhythm of life that reflects the seasons. 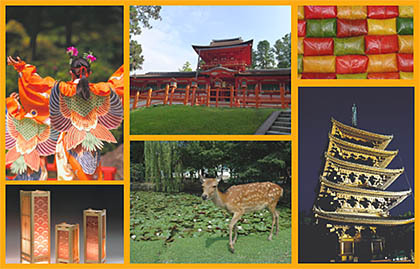 Nara has more World Heritage sites than anywhere else in Japan, with three key sites over 20 individual venues. These include the Ancient Monuments of Horyuji with their unique historic, spiritual, and artistic significance, the Historic Monuments of Ancient Nara, which acknowledge the vitality of the Nara period, and The Sacred Sites and Pilgrimage Routes in the Kii Mountain Range, which span the Yoshino and Omine Mountains. Sake, or rice wine, which is a special product that is dedicated to the gods, originated in Nara and has since been refined here to produce Nara-shu. Miwa Somen, a type of Japanese fine noodles, is another special local product that is produced in the Miwa area centering around Sakurai City, Nara Prefecture. Indeed, most somen production areas in Japan have originated from this region.